Around 60 works that were on the block at the Artiana South Asian Art auction were sold fetching close to Rs 11.1 crore. Various works by Indian artists have been on the global art connoisseur’s map for some time now and the late MF Husain’s paintings have been a favourite whenever they have gone under the hammer. Dubai-based online art auction house Artiana has concluded its first white glove (100% sold) sale, thanks to Husain. The artworks that fetched the top two bids came from the Indian modern artist. Around 60 works that were on the block at the Artiana South Asian Art auction were sold fetching close to Rs 11.1 crore. The works were estimated to rake in around Rs 10 crore. Not surprisingly, one third of the auction proceeds came from Husain’s works. “At an Asian auction if Husain is on the block there is very slim chance of any other artwork making it to the top buys,” said Lavesh Jagasia, founder at Artiana, UAE’s first home-grown auction house for art and luxury collectibles. “The top two artworks were sold to two UAE residents where Husain and is very popular. We had a hectic four day bidding session where we saw a lot of new buyers taking interest in Indian artworks. India and UAE is where most of the buyers came from,” added Jagasia. Artists that made it to the top-10 included Husain’s new to the market Trinity of Mother Teresa that fetched Rs 2.2 crore followed by another of his untitled painting that fetched Rs 1.5 crore. Other entries on the list included Krishen Khanna’s Thou Sayest So, Sayed Haider Raza’s Dhayan and Zarina Hashmi’s Home is a Foreign Place that collected Rs 95 lakh, Rs 81.5 lakh and Rs 40.8 lakh, respectively. 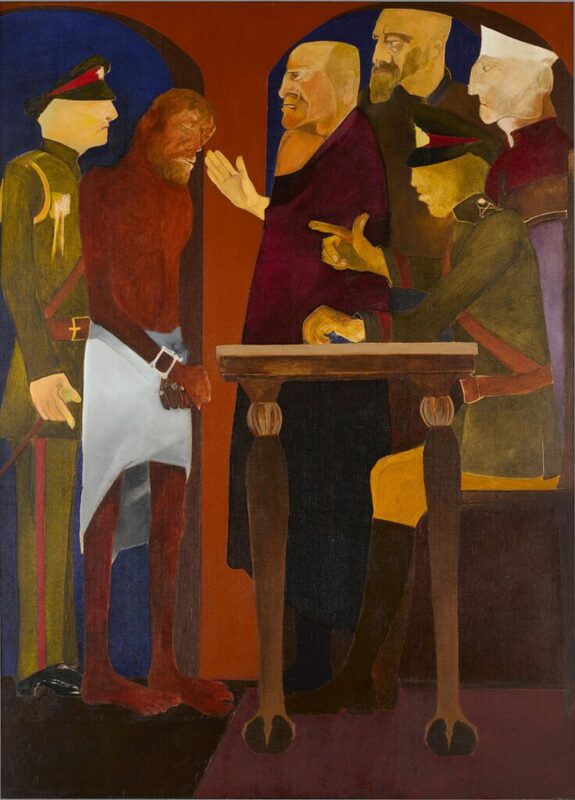 Ram Kumar, Jamil Naqsh, Francis Newton Souza, K. Laxma Goud, Bhupen Khakhar were other artists who saw maximum bids. Their lots made close to Rs 1.8 crore. With a No Buyer’s Premium Policy where buyers do not have to pay a commission for the artwork purchased, Artiana has streamlined the online auction process offering clients important elements of traditional auction house services such as expertise, gallery viewings and printed catalogues. This May, those who admire MF Husain and his works have something to look forward to. After selling his ‘The Last Supper’ at $ 1.1 million against a lower estimate of $700,000, Dubai-based online art auction platform Artiana is again putting up another 55 Indian artworks on the block at their South Asian Art – Classical, Modern and Contemporary Online Auction between May 10 and May 14. 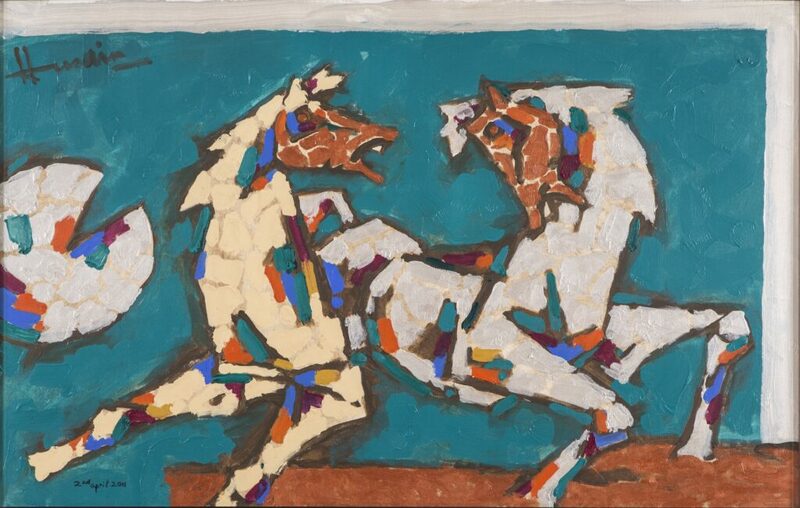 The May auction will feature new-to-market works by MF Husain with ‘Trinity of Mother Teresa’ being the cover lot and another painted on the day of the India and Sri Lanka Cricket World Cup final match — two horses depicting the two teams as stallions of the cricket world. The auction that would have 90% Indian artwork also includes ‘Thou Sayest So’ by Krishen Khanna, ‘Shanti Bindu’ by SH Raza and an impressive bronze sculpture of Vishnu among other rare works by Bhupen Khakhar, Ram Kumar and SH Raza. While ‘Trinity of Mother Teresa’ from 1989, a suitable vintage Husain artwork, has a lower estimate of $350,000, Krishen Khanna’s work has one of $100,000. The auction has a novelty factor too. Artiana has got rid of the buyer’s premium, facilitating bidders to invest more in the bid. “By getting rid of the buyer’s premium, we make sure that a bidder invests his entire budget on the artefact and not in paying service charges,” said Lavesh Jagasia, founder at Artiana, UAE’s first home-grown auction house for art and luxury collectibles. Artiana’s last sale in October 2017 clocked sales over $3 million, with 96% being sold with 128% total sale value against the lower estimate. This year, the numbers are expected to go higher. According to Jagasia, his audience is divided in three halves — Indian bidders, bidders from UAE and those from the rest of the world. After completing five successful auctions, Artiana’s future auctions are planned for art from the Middle East which will comprise works by Emirati artists including other surrounding countries and diaspora artists from this region, a sale of rugs and carpets, which will offer a range of hand-woven Oriental rugs and carpets, including textiles such as European paisley and Indian jamawar shawls. ARTIANA’s South Asian Art Online Sale is Coming Up! For four days this May, between the 10th and the 14th to be precise, there will be yet another splendid auction of South Asian Art hosted by the ARTIANA auction house from Dubai. A total of 60 lots will be featured in this online sale, including classical, modern and contemporary paintings and sculptures from the Indian subcontinent. Among the highlights, we have an impressive bronze figure of Vishnu, a collection of 20 Company Paintings, a seminal 1989 painting by M.F. 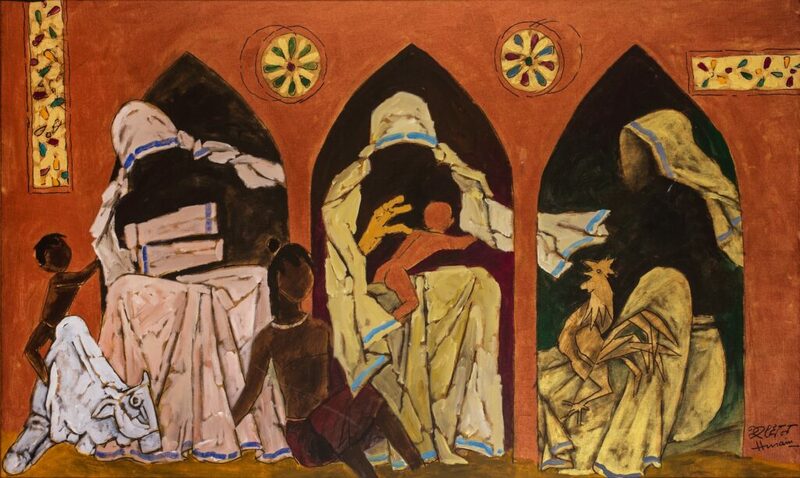 Husain, Trinity of Mother Teresa and Krishen Khanna’s marvelous Thou Sayest So from 1980. Let us also not forget the leading figures of South Asian contemporary art, such as S.H. Raza, Bhupen Khakhar, F.N. Souza, Jamil Naqsh, Jogen Chowdhury… And who better to discuss this exciting sale than Lavesh Jagasia, ARTIANA’s founder and an expert on South Asian art with as many as three decades of experience in the field. With Mr. Jagasia, we also discuss the introduction of VAT in the United Arab Emirates, its effect on the art market, the current state of affairs in that aspect, and of course, ARTIANA’s future plans. Have a read below! How did ARTIANA’s last auction do and what are the highlights of the upcoming ‘South Asian Art’ sale? Our last auction was very successful with a sell through rate of 96% and total sales at 128% of the lower estimate value. Our cover lot, the seminal work by M.F. Husain based on ‘The Last Supper’ was sold for USD 1.1 Million against the pre-sale estimate of USD 700,000. This currently remains the most expensive painting sold on our platform, and we are very pleased with the confidence reposed in us by our buyers that are reflective in our results. Being the only auction house in the Middle East that has a regular calendar of ‘South Asian Art’ auctions, what trends have you observed with collectors of this genre of art? Yes, that is absolutely correct, in fact we are the UAE’s first home-grown auction house for art and luxury collectibles and the only auction house in the region conducting auctions of South Asian art. The buyer base for this genre of art are the South Asian diaspora in the region and other overseas countries, besides collectors from India. There is a definite growing interest amongst the community to collect works of established artists, buying art for them is a tangible experience which we offer in our Dubai based viewing gallery. Quality works by Modernists with impeccable provenance generates the maximum interest, with the aesthetically appealing subjects being the most preferred, as these collectors want to live with the works rather than store them as pure investments. Given the recent implementation of VAT in the UAE, how will this affect your auctions and the art market in general? VAT in the UAE has been set at a very low rate of 5% for all goods and services. As an auction house dealing in pre-owned art and collectibles we are obliged to charge the VAT only on our commission, which is fixed at 20% of the Winning Bid, hence the net impact to buyer’s within UAE will be negligible at just 1% of the total purchase price, and overseas buyers will not be charged any VAT. We feel that the overall art market will also be able to absorb the impact of the 5% VAT between the galleries and buyers without affecting sales. ARTIANA was featured in the latest South Asian Art Market report as one of the top auction houses amongst other older auction houses, how have you managed to achieve this in a short span of time? Yes, we managed to garner close to 5% market share of South Asian art which merited our inclusion in the list of top auction houses focusing on this genre of art. Even though ARTIANA exists publicly in its current structure since last three years, actually it is a convergence of my three decades of engagement and experience in the South Asian art sphere, which brought together my expert knowledge, relationships, network and credibility to form this successful platform. Another aspect that may have acted as a catalyst is our disruptive ‘No Buyer’s Premium’ policy, which results in savings ranging from 15%-40% for our buyers as compared to the final payable amounts over and above the ‘Winning Bid’ at other auction houses. According to recent art trade reports, lack of transparency is the main stumbling block holding the online art market thus fewer people purchase art online, how will ARTIANA address this? Even though we use an omni-channel marketing strategy, and maintain a brick and mortar gallery for hosting our auction previews, we conduct all our auctions online and believe that this is the way forward for transacting art, hence our commitment towards furthering our digital strategy is always foremost in our business objectives. The key requirement to make this successful is gaining the confidence of new buyers that land on our website and retention of buyers that have transacted on our platform. Majority of these buyers use our past auction results for reference, and we permanently archive these results including the unsold lots for their information to maintain transparency on the pricing and the result of every lot offered at our sales. Besides this the prospective buyers are provided with provenance for every work after an in-depth investigation into its authenticity and ownership, and a comprehensive Artiana guarantee that covers all items sold on our platform for a period of six months from the auction closing date. These aspects add to our reliability and ensures the buyers that they are transacting with a premier dependable auction house. Please share with us ARTIANA’s journey till now and what can we look forward to in terms of ARTIANA’s future plans and sales? ARTIANA was launched three years ago and conducted its first auction in March 2016, maintaining a calendar of two South Asian Art auctions in a year. After our first year we introduced classical art in our catalogues that featured Gandharan and Indian sculptures and Indian miniature and company paintings sourced from outside India and vetted by our leading experts, these items have found a lot of interest with collectors, especially those based outside India as these works are non-exportable from within India. In terms of overall sales we grew three-fold between our first auction and our last concluded sale and have received positive feedback from our clients for our efforts in combining a curated catalogue with multiple entry levels and low impact costs. We plan to continue building similar catalogues for our upcoming sales every March and October which have become permanent fixtures in the South Asian art calendar. In this year we are planning to launch sales of Rugs & Carpets, Prints & Multiples followed by Middle Eastern art in the near future. Author Artiana Auction HousePosted on May 23, 2018 May 23, 2018 Categories UncategorizedLeave a comment on ARTIANA’s South Asian Art Online Sale is Coming Up! ARTIANA’s upcoming auction of Classical, Modern and Contemporary paintings and sculptures from the South Asian region will be held online on May 10-14 at www.artiana.com, with previews at their Downtown Dubai viewing gallery. The auction begins on May 10 at 6pm UAE time and will close on May 14 between 6:30-9pm. ARTIANA is UAE’s first home-grown auction house for art and luxury collectibles and have been receiving an overwhelming response from the art market, collectors and enthusiasts due to their efforts in bringing rare and authentic works of art to the market. Their last sale on October 2017 clocked sales over US$ 3 million with 96% lots being sold, 128% total sale value against the lower estimate, and MF Husain’s seminal work ‘The Last Supper’ being sold for US$ 1.1 million against a lower estimate of US$ 700,000. Their May auction features seminal new-to-market works by MF Husain with ‘Trinity of Mother Teresa’ being the cover lot and another work of two horses painted on the day of the India and Sri Lanka Cricket World Cup final match depicting the two teams as stallions of the cricket world; including an important work ‘Thou Sayest So’ by Krishen Khanna, ‘Dhayan’ by SH Raza and an impressive bronze sculpture of Vishnu among other rare works by Bhupen Khakhar, Ram Kumar and SH Raza. Future auctions are planned for art from the Middle East which will comprise works by Emirati artists including other surrounding countries and diaspora artists from this region, a sale of Rugs and Carpets which will offer a range of hand-woven Oriental rugs and carpets including textiles such as European paisley and Indian jamawar shawls, and a Prints and Multiples sale presenting prints by international artists executed in various printmaking techniques and three-dimensional multiples. With its No Buyer’s Premium Policy, ARTIANA has redefined and streamlined the auction process offering clients the important elements of the traditional auction house services such as expertise, gallery viewings and printed catalogues. Its USP slogan “What You Bid Is What You Pay”. Prospective buyers can view the works by prior appointment. Registration for the auction can be completed online at www.artiana.com or through their mobile app available on both Google Play for Android and the App Store for Apple devices. ARTIANA conducts the auction process online on www.artiana.com using their proprietary auction application software, and distributes both online and physical catalogue for every auction. ARTIANA is founded by Lavesh Jagasia, an expert with three decades of experience in the sphere of Indian Art. He is a specialist in Modern and Contemporary South Asian Art and has collaborated with most of the leading South Asian artists on various projects.